Kim Taylor - aka "The Sassy Crafter" - wrote with news that her recycled sweater bags have been featured in Stephanie Girard's new book, Sweater Surgery! The book features several of Kim's original patterns, including my favorite, "The Cheerleader." This little leopard number is also a fave. Stop on over to Kim's blog to check out the post on this new book, and Kim's other cool crafts. Good work came out of the art studio last week, and even after Debra went home to Pittsburgh, I kept going in a fever. I collaged with books, cyanotype prints and encaustic until, finally, my wax griddle started to smoking noxious odors from within. The image above is a photo of one of my favorite prints from the week. It is a photo of Beach Four, on Kalaloch Peninsula in Washington State, where Mike and I spent our honeymoon. Using a computer, I reversed the image to make a negative, then printed it on Portico transparency film. (You need this special film to get the job done - don't skimp!) I put the negative over papers treated with cyanotype chemicals that I bought in a kit and mixed in the laundry room with the aid of a night light. The negatives were exposed outside under bright sunlight, and Debra and I spent many happy minutes chatting in the grass while we waited for the paper to turn from acid green, to dark blue, to gray. We gave them a one minute wash in regular white vinegar to bring out the beautiful blue mid-tones, washed the prints in water, then dried them flat on newspaper. It wasn't as easy as I make it sound. We experimented quite a bit with different papers and wash times, with plenty of frustration mixed in. The fancy Crane's paper that came with the kit gave me the most disappointing results. It couldn't stand up to a vinegar wash and a water rinse. At least I can use them "as a base for collage." That's a Debra-ism, and translated from her language to my sister's, it also means, "Man, those are ugly." I've had a love affair with dioramas ever since I was a kid, so when I came across this video over on Magpie & Cake, I just had to post it here. I love the idea, and I love the song. Maybe even more after watching Be Kind, Rewind last night. Once a month, our local knitting group - "The Castoffs" - meets to learn and share new techniques. Each meeting starts with a "show and tell", and this month, I brought my house guest, Debra. This wonderful piece is her "Lacy New Zealand Scarf", made of yarn spun from the hair of the Kiwi possum. The yarn is very light and soft. It almost feels like cashmere. Here is the pattern, if you'd like to give it a try. You'll need lace weight yarn and needles a size bigger than recommended on the yarn label. Debra and I think it would look great with any kind of yarn - I'd like to try a colorful sock yarn. Row 3: K6 *(YO) 2 times, K1, (YO) 3 times, K1 (YO) 4 times, K1, (YO) 3 times, K! (YO) 2 times, K6. Repeat from * 1 more time. Row 4: Knit, but drop all YO sts off the needles. You are back to 26 sts. Stitches may be pulled into shape after finishing row 2 or row 6. Row 7: K1, *(YO) 2 times, K1, (YO) 3 times, K1, (YO) 4 times, K1, (YO) 3 times, K1, (YO) 2 times, K6. Row 8: Knit, but drop all YO sts off of the needle. You are back to 26 sts. Repeat the rows 1-8 until desired length is reached. Loosely cast off. For the first wave, we collected natural materials from the woods and used them to print on pages torn from books or cut up prints Debra made at Carnegie Mellon. Last night, I made a series of digital negatives from photos taken during a visit to the ghost town, Bannock, Montana. As soon as the sun is strong enough, I'll be printing these on pages torn from books. Debra is making line drawings on transparencies and printing them directly onto found images. I painted the cyanotype solution over the book pages and left sections of text uncoated - so I'm hoping that the printing process will reveal a new story, that I can stitch together in an artist book. Mixed-media artist Debra Tomson Williams arrives today from Pittsburgh. Here she is preparing "Feel Better" for a recent exhibition. Gallery visitors were invited to take home one of these hand-crafted plastic tissue boxes. In exchange, Debra asked them to tell her about a time when they needed a tissue and didn't have one. Those memories will be made into an artist's book - possibly this week! Debra and I met in 2000 at Haystack Mountain School of Crafts. She was my roommate and my classmate in a Josef Bajus' fiber workshop. We email several times a week, but I haven't actually seen her since 2003 when we met in Baltimore to catch a show at the American Visionary Art Museum, a museum of "outsider" art. She'll spend a week here at Paradise Ranch, working with me in the art studio. Or not working, depending on what we feel like doing. Awhile back, I was using Etsy's Alchemy service to get some things done. Alchemy links sellers with craft skills to buyers looking for custom goods. This sundress was made for me by Amanda Archer, an independent clothing designer based in San Francisco. I sent Amanda the fabric (Kaffe Fassett Midnight Organic Dots) and the notions, and she modified the store bought pattern to fit my body. Because I am, ahem, somewhat bosom-y, this is no small task. I needed someone who had professional pattern-making skills and I found her. This custom beauty was just $60, not including fabric. I love it. Tal picked out all the fabrics, designed the color blocks, cut the fabric and sewed the pieces together. I fended off the white kitty (see his glowing eyes on the staircase?) and swept in at an emotional low point to help with the ties, but otherwise - it's all hers. 1) Buddy and I have not taken the therapy dog exam yet. I need to attend a weekend training workshop and I haven't managed to move to the top of the wait-list. 2) I loved my New York City Ballet Workout classes. It's great to be so old that the teacher is happy if you just "hop" instead of grand jete. Now that I'm back in Montana, I have the DVD from Netflix but haven't tried it yet. Lots of long river walks with Buddy and serious yard work instead. 3) I am still working on a website for my consulting business after a few stops and starts. I did design a new banner for my website, all by my own self. Not perfect, but o.k. 4) I did finish knitting my first sweater, and it turned out o.k. Not perfect, but o.k. I sent it to the artist Debra Tomson Williams as a Valentine. 5) My book. I went through a spurt of writing in the winter, took a leave-of-absence, set it down, and haven't picked it up again. It's time. I'm comforted by Anne Lamott's comment to an interviewer that it takes her a first draft just to get to know the characters. 6) I'm over the cookie thing. I still eat them occasionally, but I'm not baking as a comfort-process anymore. I'm feeling so much better after this surgery that I keep busy enjoying work, gardening, art or something else. I didn't make the list of more peaceful times but I don't feel like I need to either. So that's good. 7) I wanted to start drawing, but in six months I have not picked up the proverbial pencil. So....about 50%, really. And still time to keep going. Fabric genius Kathy Mack recently launched an online store, Pink by Post. The store offers patterns, fabric and tools for the "modern sewist." I love this fabric - Snow Bunnies in Bathing Suits! It's been awhile since I've done anything with felted sweaters. Just not the right weather, I guess. But I love these 'creatures' EveryLittleThing is making. A good use of sleeves and very cute! I squeezed in some time at the thrift store this morning after running a couple of errands in town. When I saw these three lovelies, at 40 cents apiece, I thought they might look great restyled as skirts! This project has been on my mind ever since I saw the skirt Belladia made. You can find her photos and tutorial right here. Head over to etsy.com and search for 'pillowcase skirts' and you'll be amazed by what comes up. I wonder if my Marimekko obsessed mum has any unmatched sets in her linen closet? How about this little number? There is a pattern you'll find in Angry Chicken's book, Bend the Rules Sewing, that looks just like this! A very trendy, inexpensive gift for the toddlers in your life. This towel is another thrift find. Past it's prime as home decor but I'm thinking it will make an excellent beach bag. We can never have too many of them around here! I'm going to use Martha's simple instructions. collage 3, originally uploaded by thisisloveforever. I love this fabric collage from thisisloveforever - I wish I had seen it before it sold. I have a growing letter H collection in my art studio. 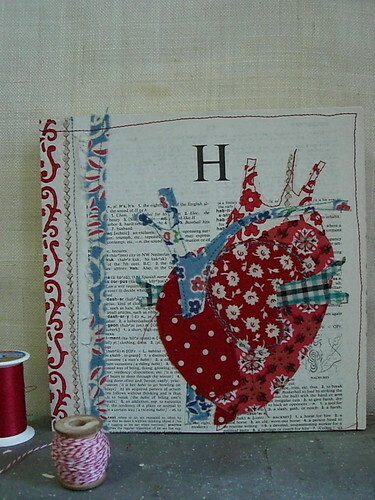 I also love to use images of the heart in my own collage. Sigh. The Lake Has Many Moods. An afternoon on Flathead Lake, watching a rain storm move through. The power went out the other day while I was working in the studio. This happens more often than you might think. We have one line running south from town and all it takes is someone to crash a car into a utility pole or a dead tree to take down a power line. In this particular instance, I happened to be rubbing some crayon on a photo printed from my inkjet. I was curious to see what would happen to the crayon if I blew my heat gun on it - would it give an encaustic effect? But then I remembered I couldn't use the heat gun - no electricity. So I busied myself with some other projects. As the minutes ticked by, I realized I wouldn't be able to iron the fusible interfacing to my fabric book. And on this rainy day it was a little bit darker in the studio than I like it. My frustrations gathered. Intensified. I wasn't going to be able to make art on an otherwise appointment-less Saturday. It is the year 2008. And I had NO ELECTRICITY. Scanner Crutch: "I'd like to use this image of an apple in my collage, but I want to scan it first, in case I want to use it again and develop a theme." It never gets scanned, and of course, the original is never used either. I have mountains of images I am 'saving' in this manner. What's worse, is I have the project already sketched out in my head. So the images can't be used for new projects either. Kind of like saving seats in the school lunchroom for a friend - you send away all the other people that also want to sit next to you. Photocopy Crutch: "Before I can wax this image, I need to print it using thermal toner." I must pass the UPS Store about ten times a week but never seem to make it in the door to copy the images I have set aside. Or I fret about the kind of toner and process the UPS copiers use and whether or not it will be friendly to encaustic. Even though I know it is thermal and I haven't heated up my wax in nearly six months. Photo Crutch: "I would submit this piece to the show if I had slides." I used to say I didn't submit my work to gallery shows because I don't have a slide portfolio. Now everyone accepts digital images, so I use the excuse that I don't have a consistent body of work. Which matters most if you're seeking gallery representation, but even so, is a little more than lame as excuses go. Sewing Machine Crutch: "I really want to do some freehand embroidery on this book before I call it finished." I bought an expensive machine to use for mixed-media and fiber art projects. Instead, I got totally high sewing stuffed sheep for, like, a year. And that's fine, I love them, and the sheep love me. But I get hung up on an art piece thinking I need a certain color thread, or wishing I had a particular fabric that it is in the closet at my other house in Oregon. Art Supply Crutch: "Before I finish this, I need to get some beads/pigment/astroturf/resin/thread/paper/gesso." Shopping for art supplies is not the same as making art. I'm always buying supplies and never using them. When I clean my studio I'm astounded by the interesting stuff I have in there. Quite frankly, I don't even know what I have in there. It is a kind of perfectionism, and in my case, it's a fear of finishing. Once things are finished, they will be judged. And when it comes to criticism of something I've put my heart into, I'll admit I'm weak. Even though the business side of me knows that what I see on artists' websites are the best examples of their work - not the work-in-progress, the experiments that resulted in failure, and the simply ugly that happened along the way. My goal for summer is to finish the projects I have started. This one. This one. This one. This one. And that's just a start. It is an ever-growing mountain of unfinished art. And if I can do that, I will have enough work to photograph and submit to shows. No excuses. 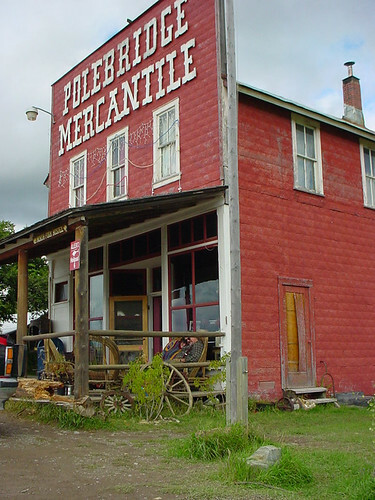 Polebridge Mercantile, originally uploaded by glacieradventure. Today, Mike and I are going to play hooky and drive up to Polebridge, a tiny hippie community on the west side of Glacier National Park. We love it over there - and not just for the homemade cookies, pastries and savory tarts sold at the Merc. A collection of small, but inspiring, paper buildings. Vintage cardboard "putz" house. I started collecting these dimestore Christmas decorations a couple of years ago. Try your hand at making a cardboard house using this pattern, or this one. Salad bars, and other quick and healthy food stops. Sipping on an Iced Skinny Latte while browsing through a good book store. Movie houses that show independent films. The endless search to find a parking spot every time you move your car. Ridiculous rents and crappy apartments. Never being able to relax when you're sitting by yourself on the beach or walking at night. Lawyers, "models", and other high maintenance neighbors. I have to hit the streets today hoping to find something acceptable to wear to a summer wedding. Ten weeks post-op I still have swelling that will have to be taken into account. This pouch doesn't just blend in with the rest of my fat - it has it's own moods and opinions about what "we" do and wear, growing and shrinking depending on what I eat, how I exercise (yard work is o.k. - but it doesn't like hiking), and the comfort of my clothing. Yes to the Eileen Fisher pants, NO to the Calvin Klein jeans. This morning I spent a few minutes on Jessica Hagy's website, "Indexed." This card seemed to express exactly how I feel at the moment. I'll buy anything I can find that makes me, and my swollen belly, look acceptable. Wish me luck.